Ahead of the highly-anticipated champion versus champion clash slated for January 19th, 2019, flyweight champion, Henry Cejudo, has unapologetically targeted rival, T.J. Dillashaw, for his 'skinny' 125-pound look. Dillashaw is currently the UFC's bantamweight champion and will be going head to head in a double-championship clash against flyweight champion, Henry Cejudo, at the Barclays Center, in Brooklyn, New York. On the night of August 4th, 2018, Henry Cejudo went on to avenge his loss against a dominant champion in Demetrious Johnson, under the UFC 227 fight card, at the Staples Center in Los Angeles. 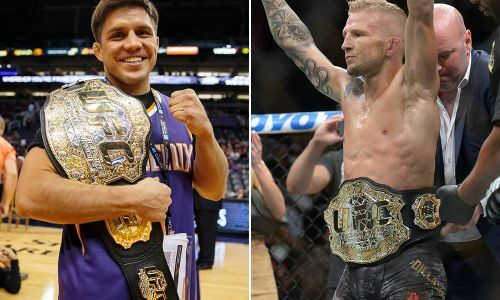 Soon after the win, Cejudo was seen calling out the winner of the main event bout featuring bantamweight champion, T.J. Dillashaw, and fellow 135-pound contender, Cody Garbrandt. Dillashaw secured a first-round technical knockout win over Garbrandt, retained his belt, and made his case for a twin-championship mega-fight against Henry Cejudo. Going into the fight on Saturday night, January the 19th, Cejudo will be walking into the Octagon as a natural 125-pounder. In the case of Dillashaw, however, some foresee the extra ten-pound weight cut to be detrimental to T.J.'s success, given the fact that his strength lies at fighting in the bantamweight category. The UFC has had a history of fighters pulling out of matchups due to weight cut related complications, leaving Dillashaw very much susceptible to the same situation. Cejudo also gave credit where credit was due, and this time, it was all high praises for his neuroscience team, aiding him through his weight cut procedures. “I’m showing you guys what a true flyweight looks like, not depleted, nice and strong, that’s getting ready to take over the world. A lot of that I would give credit to my neuroscience team, NeuroForce1. Everything that I do is all based on technology and science, and I have never felt so good. At the age of 31, I feel like I’m in my prime, baby. I’ve never felt so strong." Leading up to their double-championship title fight at UFC Fight Night 143, both Henry Cejudo and T.J. Dillashaw will be looking to make history. Cejudo has confessed to knowing the hardships to make the 125-pound weight mark and expects Dillashaw to be facing a significant disadvantage, come Saturday night. Do you think Cejudo will expose Dillashaw, or will the latter prove to have that many more tricks up his sleeve? Be sure to leave your predictions in the comments section below!